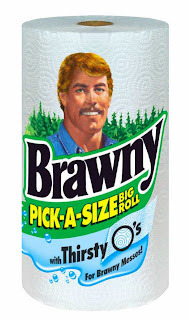 In a less than absorbing decision, the Board sustained an opposition to registration of the design mark shown immediately below, for paper towels and like paper products, finding it likely to cause confusion with the two registered marks shown next below for paper towels. Fort James Operating Co. v. Royal Paper Converting ,Inc., 83 USPQ2d 124 (TTAB 2007) [precedential]. Applicant conceded that the goods are identical in part and are sold in the same channels of trade. Because the goods are identical, the Board must presume that they are sold to the same classes of purchasers. And it observed that these purchasers would not exercise a great deal of care. Opposer claimed that its marks are famous, and its sales revenues and advertising expenditures for paper towels were "extremely impressive." In addition, Opposer widely advertised and promoted its goods. However, Opposer's towels are sold under the marks BRAWNY, MARDI GRAS, GREEN FOREST, and SO DRI, which marks overshadow the design marks in Opposer's marketing materials. "This is not a case where consumers are presented through advertising and other promotional material with repeated references to opposer's design marks independent of opposer's other marks." Consequently, the Board was unable to find that Opposer's design marks "have achieved the renown associated with fame." Turning to the marks, the Board cited the boilerplate proposition that when marks appear on virtually identical or closely related goods, the degree of similarity of the marks necessary to support a likelihood of confusion finding is decreased. Considering the overall commercial impression of the marks, the Board found the designs at issue to be "highly similar." "... both parties' marks are embossed on paper towel sheets. 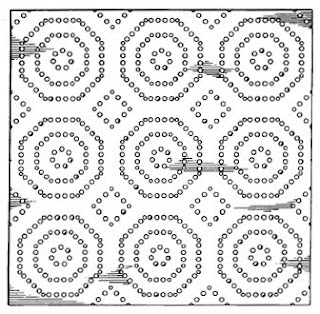 The marks consist of circular-shaped designs that are repeated in an evenly-spaced pattern on the paper towel sheets. Moreover, the smaller interlocking designs in the parties' marks are identical/similar in shape." Next, the Board wiped away Applicant's evidence of third-party use purporting to show similar marks in use on similar goods, because Applicant did not show the extent of use of those third-party embossed designs. In any case, "none is similar to the designs at issue." Although there was no evidence of actual confusion, the Board pointed out that such evidence is "extremely difficult to acquire" and anyway is not needed to prove a likelihood of confusion. The Board then disposed of two more feeble arguments made by opposer: (1) that because the registered designs are used with BRAWNY and other marks, confusion is eliminated; and (2) Opposer had ample opportunity to conduct a survey but failed to do so. The Board pointed out that (1) "a product label can bear more than one trademark without diminishing the identifying function of each portion," and (2) surveys are not required in Board proceedings. Weighing the du Pont factors, the Board found that confusion is likely. Text Copyright John L. Welch 2007.